We offer our clients a wide range of Polyplastic Earth Pit Cover. These products are manufactured using high grade raw material using latest technology machines. Offered products are manufactured under the guidance and supervision of our quality check experts who ensure that they deliver only good quality products to our clients. The Plastic pit cover offered by us are made keeping in mind the needs and requirements of our clients. 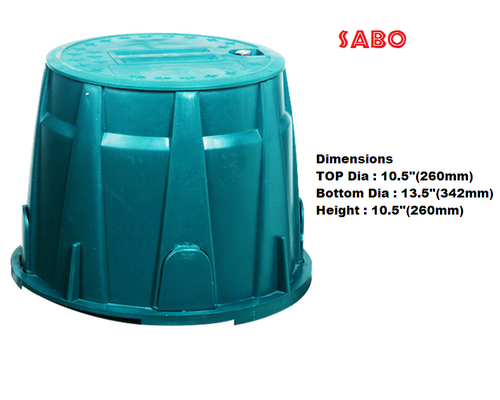 Established in the year 1997, we, ”Sabo Systems (P) Ltd.” manufacturer, importer, supplier, distributor & exporter of a wide range of Surge Protection Devices, ESE Lightning Conductor, Exothermic welding, Copper bonded rod, Chemical earthing of Copper Electrode, Copper bonded electrode, copper bonded rod as well as GI electrode with Back Filling Compound, Gel earthing, Electrical panels, etc. We manufacture these products using superior quality raw material. Offered products are in huge demand and are widely appreciated for their efficiency and high durability. These products are made under the strict supervision of our quality check experts. We offer these products at the most affordable rates to our clients. We manufacture these products using high grade raw material which is sourced from the most reliable vendors of the market. The products offered by us are made keeping in mind the needs and requirements of our clients as per the set international standards. These products are quality checked by our professionals on various parameters so as to ensure that we deliver only qualitative products to our clients. These products are made under the strict supervision of our quality check experts. Our professionals carefully study the market and find out the various needs and requirements of our clients. These professionals manufacture these professionals using latest quality and high technology machines which are upgraded time to time. We ensure that we deliver the manufactured products timely to our clients at the preferred destination. We export our range of products all over world.